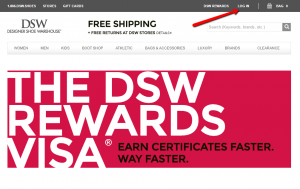 DSW Credit Card offers a great reward system (especially for DSW customers) as well as a user-friendly online platform where you can manage your account. On this page, we will show you how to log in, how to retrieve your username and password and how to open a new account. Step 1: Go to the credit card’s main page and, on the upper right side, click on the ‘LOG IN’ button. This will open another webpage where you can introduce your credentials. If you forgot your username you must call the Customer Service (1.866.DSW.SHOES) to recover it. Step 1: Open the log in page and click on the ‘Forgot password?’ button. You will be redirected to a page where you can introduce your email address in order to receive a new password. 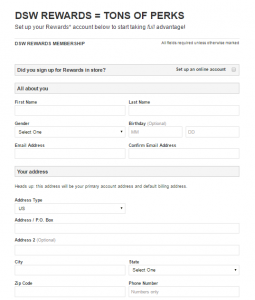 Step 2: Introduce your email address in the appropriate field and click on the ‘SUBMIT’ button. You will receive soon an email with a new, temporary password. Step 1: Open the Log In webpage and click on the ‘JOIN NOW’ button in order to open a page where you can introduce your personal information and set up a password in order to create an account. Step 2: Introduce your personal information, including your name and surname, gender, date of birth (optional), email and postal address, and phone number. Step 3: You will be asked to create a case-sensitive password between 8 and 25 characters. Finally, click on the ‘SET UP ACCOUNT’ button on the bottom of the page. Q: What does DSW stand for? DSW stands for Designer Shoe Warehouse, an American footwear retailer of designer and name brand shoes like Audrey Brooke, Kelly & Katie, Lulu Townsend, and Poppie Jones.The company has 500 stores in the United States and a website. 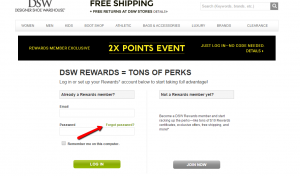 Q: What does DSW Rewards Premier include and how can I become a member? In order to achieve the Rewards Premier Membership status you will need to earn 6,000 qualifying points by spending $600 within one calendar year. Once that condition is fulfilled you will be upgraded to Rewards Premier Membership status. So as to keep the achieved status in the following year, you will need to achieve earn 6,000 qualifying points for that calendar year. 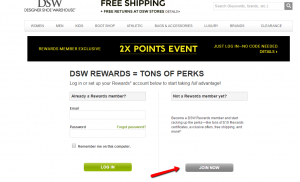 Some of DSW Rewards Premier Benefits are 5 bonus points per dollar spent at DSW, 2 Triple Points Days per year, date chosen by the Member and First-in-line service through our customer service center shoephoria. Q: How do points add up? The points add up when you perform certain eligible purchases using your DSW Credit Card. 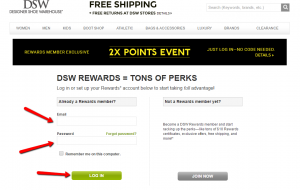 You can earn points when you buy shoes at DSW. For $60 spent you can get up to 1200 Points. For $30 spent on Gas, you are rewarded 60 Points. A $100 phone bill may earn you 200points.